In a beautiful Black frame with mount. (Size 205mm x 155mm x 18mm Deep). Image size is 6x4. Fitted in card mount. Photo carry's the autograph of the player himself. Note to USA/Canada customers; We are a U.K. based family run business specialising in sports pictures. 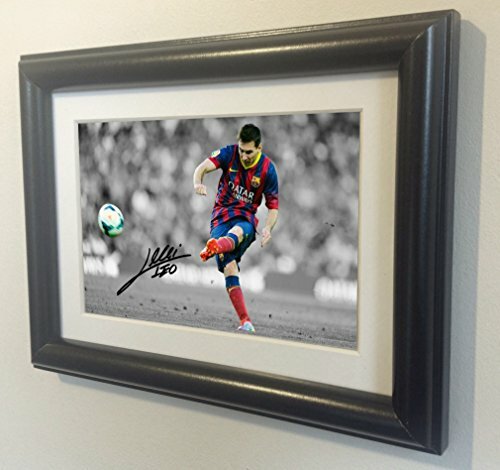 All our frames are made to order and shipped within 24hrs. We ship by Royal Mail/United States and Canada Postal Service's. Usual delivery times are 5-10 days to the States and Canada. Occasionally it can be longer if there are any custom delays but this is rare, unfortunately this is out of our control. We do our best to speed this up by marking them 'gift' with a low value to avoid charges. Vintage Wrestling Shoes on Vintage Background Fine Art Photography Print, Wrestling Nursery Art, Vintage Sports Nursery Art, Wrestling artwork, Wrestling Prints, Nursery decor, Kids Room Wall Art.